Much of the US has just switched to daylight saving time, gaining an extra hour of light in the evening for the next few months. But not everyone is in favour and every year the practice triggers a national debate. So what are the arguments for and against? Some experts are so in favour of daylight saving that they say it should be made permanent, meaning not turning the clocks back in autumn. Research by the Brookings Institution and Cornell University pointed to a fall in crime after clocks go forward. Authors Jennifer Doleac and Nicholas Sanders said that most street crime took place during the typical evening commuting hours between 17:00 and 20:00 "and more ambient light during typical high-crime hours makes it easier for victims and passers-by to see potential threats and later identify wrongdoers". Along with other commentators, they say that the problems caused by disrupting people's body clocks such as car accidents and increased rates of hearts attacks, could be avoided by making daylight saving time a permanent fixture. Some studies have suggested that although daylight saving was introduced to save energy, any reductions in electricity are offset by increased use of heating or air conditioning and also vehicle fuel. Research from Johns Hopkins University and Stanford University has also suggested that sleep disruption caused by the "spring forward" effect causes an increase in traffic accidents. Using data from the US National Highway Transportation Safety Administration over a 21-year period they found a small but significant, increase of fatal road accidents on the Monday after the clocks went forward. They also found a significant increase in crashes on the Sunday of the autumn shift. Environmentalists are also questioning whether daylight saving time actually saves any energy. A study by the University of California Energy Institute suggested that putting the clocks forward caused electricity demand to rise as there was a "tradeoff between reducing demand for lighting and increasing demand for heating and cooling". 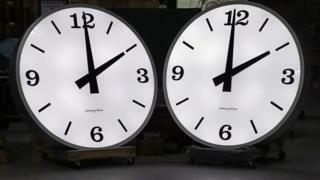 Critics of moving clocks backwards and forwards at different times of the year also say it can disrupt relationships. Research carried out by the journal Social Psychological and Personality Science said that couples reported more conflict following poor nights of sleep. A study from Finland has also suggested that daylight saving can increase cases of stroke. Author Dr Jori Ruuskanen, of the University of Turku, said an analysis of stroke data in Finland from 2004 to 2013 showed the overall rate of ischemic stroke was 8% higher in the two days after clocks went forward. "Looking at over a decade of stroke data, we saw a temporary increase in stroke incidence after daylight saving time transitions," Dr Ruuskanen told US broadcaster CBS.